Our clients, like most Americans, try to do the right thing. They understand that the responsibility of saving for retirement is squarely on their shoulders, and they struggle to put money aside month by month, year by year. But where’s the happy medium? How much should they save (or can they save) for the future if they still want to enjoy life and have fun today? As with most of the truly important questions we face, there is no one right answer. Perhaps the best answer is that you’ll need to weigh your priorities day-by-day so you can make the right choices. A recent survey asked Americans to talk about their biggest retirement fears. The top concern, not surprisingly, was outliving their income and running out of money. The second was being able to maintain their current lifestyle in retirement, and the third was keeping up with healthcare expenses in retirement. The way to combat all three fears, of course, is to save more today so you can be better prepared for tomorrow. But here’s the kicker. An equally big concern was “missing out on the fun things in life.” So while Americans do understand they need to save for the future, they also want to enjoy today. After all, who wants to save and scrimp every day and then die before having a chance to enjoy it all? And guess what? These choices don’t go away just because you make more or have more money. Believe it or not, even wealthy people struggle with the daily trade-offs between saving and spending. One of the most important things we do to help our clients is give them a saving and spending roadmap, and then we update that map every year. The roadmap tells them how much they need to save each year to reach their goals, and how much they can spend each year – once in retirement – without undue risk of running out of money too early. Without a roadmap, you just can’t make good decisions. 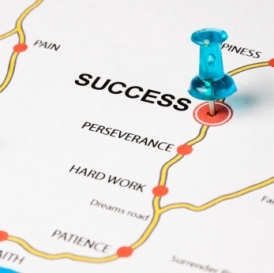 With a roadmap, it gets much easier. Once you know what you need to save each year, set it up on autopilot by “paying yourself first.” That means setting aside money each paycheck to fund your 401(k), your IRA, or your personal investment account. No more stress, no more mess. It’s automatically done for you, and what’s left over in your bank account each month is free for you to spend. What could be easier? In retirement, we set up the same system in reverse. Each month, your sustainable spending “allowance” gets put in your account. Go ahead, spend it! Stick to this system, and you’re guaranteed to stay on track. Where do we see clients running into trouble? Either they spend too much, and take out way more than their monthly withdrawal, or they spend too little, and we literally have to beg them to go out and live it up a little! Sometimes, it’s all about the size of your fun. To some people, a “trip” may mean a round-the world, first-class, 5-star hotel extravaganza. To others, it might mean taking the grandkids to a park for the afternoon. There is always time – and money – for fun. But ask yourself how many zeroes your fun requires, and find ways to build more fun into your day-to-day life without racking up big expenses. Our clients know that I love to travel, and I try to fit in a few longer – and more exotic – trips each year. But this summer I’ve been enjoying short weekend getaways with my daughter. As a recent engineering grad, I don’t think she’ll be living in South Florida for long, and I’m taking advantage of her company while she’s close by. 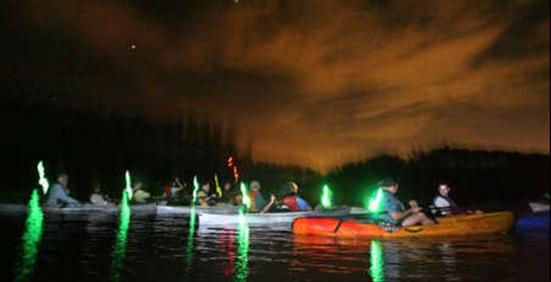 This last weekend, we went up to the Merritt Island National Wildlife Refuge (next to Cape Canaveral, Florida) for a night-time “bioluminescent” kayaking trip we’ve had our eye for over a year. It wasn’t a big deal. It didn’t cost a lot. 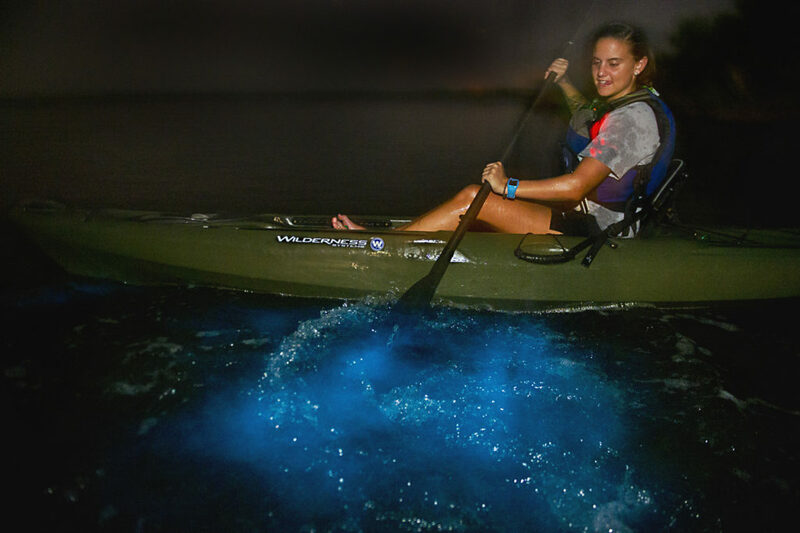 We drove up and spent the night, since we were out on the water until almost 1 a.m. Kayaking at night is an amazing experience and while we were there we saw manatees, dolphins, seemingly dozens of shooting stars and of course the glowing “bioluminescent” plankton that light up the water whenever there’s movement. ← lt Will Take HOW Long To Double My Money? ?